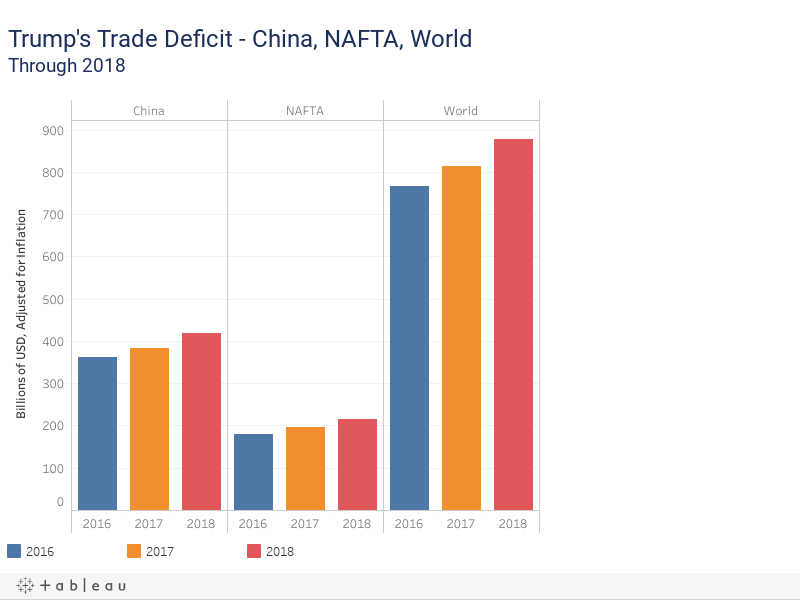 The 2018 annual trade data reveal the highest-ever U.S. deficit with China and the highest NAFTA deficit in a decade occurred during the second year of the trump administration. After increasing in 2017 compared to 2016, newly released trade data from 2018 shows that the U.S. trade deficit continued its upward climb despite Donald Trump’s campaign pledges to reduce it. The goods trade deficit with China in 2018 is the largest ever recorded at $419 billion, up from $384 billion in 2017. This compares to $361 billion in 2016, President Obama’s last year. The goods deficit with NAFTA partners in 2018 is up 10 percent relative to 2017 – an increase from $196 billion to $215 billion – and is larger than any period since before the 2008-09 financial crisis. The goods trade deficit with the world of $879 billion is larger than any year since before the 2008-09 financial crisis – up 8 percent over 2017. These figures are adjusted for inflation to the base year of 2018. Thus, the figures represent changes in trade balances expressed in constant dollars, so, for years prior to 2018, the numbers are different than the data unadjusted for inflation that is provided by Census.